Look at her pretty wee dress as she's standing. So cute. Isn't the wee dress pretty? The fabric is called Daisy Pistachio from Hilary's. Hey Folks. When Hillary's recently contacted me and asked me would I like to take part in their Craft Competition I of course said yes. How could I not? 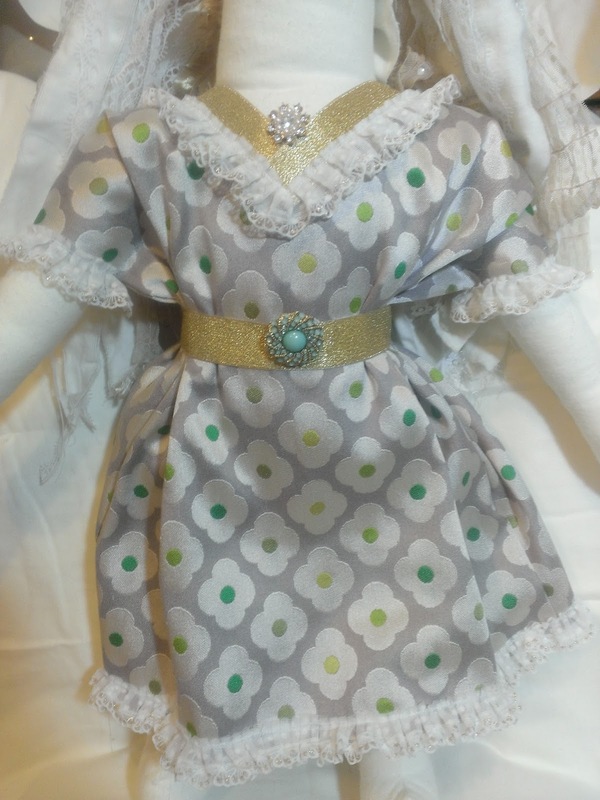 Just take a look at that fabric I was given to make my project with, its called Daisy Pistachio. So of course I said yes. If you'd like to read about the Competition please click HERE. As you all know, I haven't been sewing long. In fact, since I've had my sewing machine, this project will be my 3rd sewing machine project ever. So I'm a little nervous to say the least. So, I sat thinking long and hard about just how I could do this beautiful piece of fabric justice. And then I thought....."AH HA! 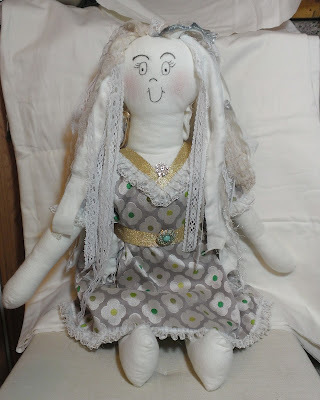 ".....I have been wanting to make my Auntie Fiona a fabric doll and when I saw the fabric I'd chosen from Hilary's, I knew it was the perfect fabric for this doll. There is a story behind this gift so bare with me, lol. When I was around 10 years old, my Auntie Fiona decided to leave our little corner of Northern Ireland for pastures new in Malta. To say I was going to miss her was an understatement. It broke my little 10 year old heart. My wee Mammy and I went to her apartment to help pack up her things. She gave me her black and white posters from her bedroom wall and asked me to "look after them" for her. When her apartment was pretty much all boxed up, we sat on her living room floor, picnic style having ordered a takeaway from around the corner. I remember that night vividly, right down to the plastic red topped salt shaker my aunt had to borrow from the Chinese Takeaway as she had no salt left in her apartment, lol. Well, the time came for my Aunt to leave Northern Ireland and off she went to begin her new life in Malta. I wrote to her every few weeks and when it came to her birthday, I wanted to make her something special. Now remember, I was probably only 10 years old at this stage, I didn't have a sewing machine and certainly didn't have any sewing skills at all. But I decided to make her a Pot Pourri Doll. Yes, you read that correctly, a pot pourri doll, lol. I basically took a piece of fabric, cut and hand sewed it into some form of doll shape and stuffed it full of smelly Pot Pourri. It wasn't a very pretty looking thing, needless to say. But, being a 10 year old little girl, I was so pleased with it. I wrapped it up, placed it in an envelope and off I went to the Post Office to send the little Pot Pourri doll on its long journey to Malta. Of course, with it being a lumpy bumpy smelly thing in an envelope, Customs were a bit suspicious about the package and opened it up to make sure I wasn't sending anything dodgy, disguised as a handmade doll, lol. Anyway, it eventually arrived with my aunt who was so delighted with it. She phoned me to let me know it had arrived and how much she loved it. Of course, I was so overjoyed and beaming from ear to ear. Obviously years went by and the little doll never really entered my head again. 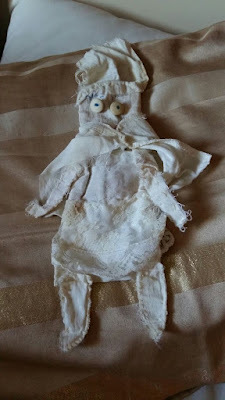 I assumed that after a certain amount of time passed, that the doll would have eventually lost its pot pourri smell and sooner or later would have made its way into the bin......after all, its was a dodgy hand sewn doll stuffed with Pot Pourri, lol. But, that was not the case. 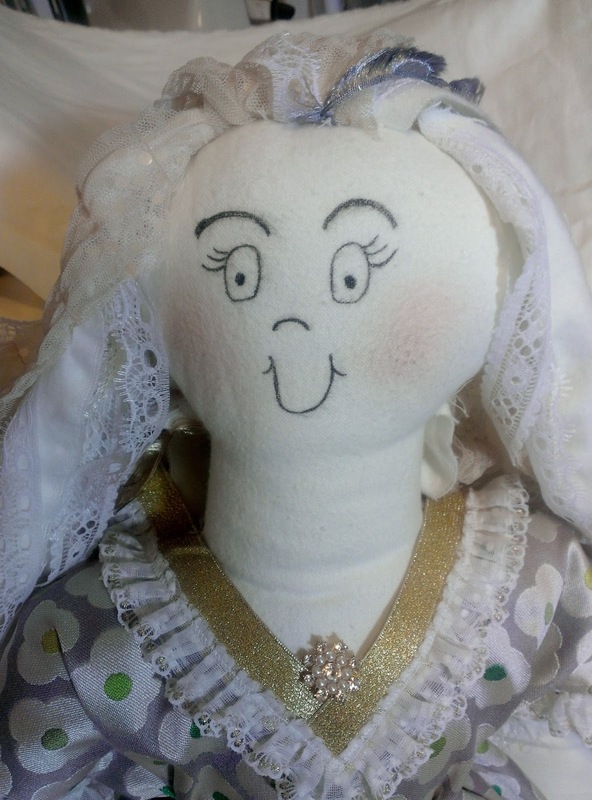 Many years later when my Aunt decided to leave Malta and come back home, there she was on a flight home with her young daughter, her luggage........and the Pot Pourri doll I had made her. That doll is now 25 years old, and to say it is in a bit of a state would be putting it politely, lol. But she had kept it all those years, even though it is a little worse for wear now. 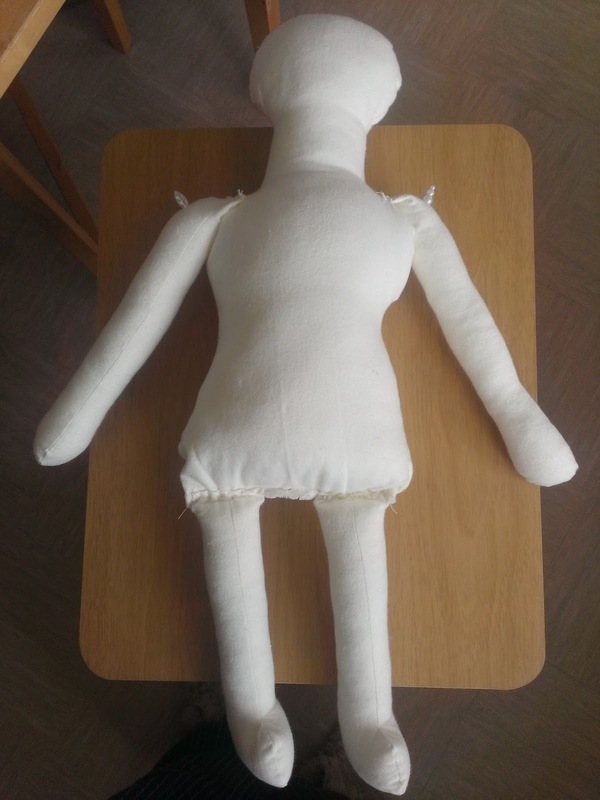 Anyway, I thought it was time for a doll upgrade so decided I wanted to make my Auntie Fiona a new doll to replace the one I had made her all those years ago. Hopefully this doll will be made a little better and won't be filled with smelly old pot pourri or have a strange odour to it, lol. Thanks to Hillary's, I have been able to make my aunt a much more appropriate looking doll, that doesn't contain 25 year old, mouldy Pot Pourri, lol. Here is what I have created, using the beautiful fabric provided to me by Hillary's. I hope you like it and I certainly hope my aunt likes it too. 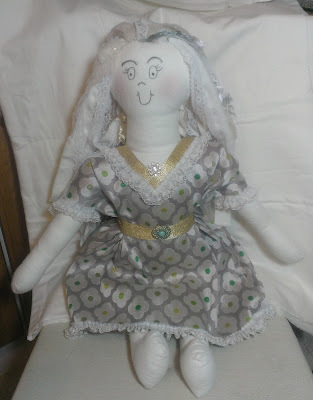 In order to repeat history to a degree, I felt this doll had to be entirely made by me from scratch, just like the good ole days. So no pre-made template or ready made doll body was used. I made everything myself. I drew a quick sketch of the dolls body on some good old printer paper. 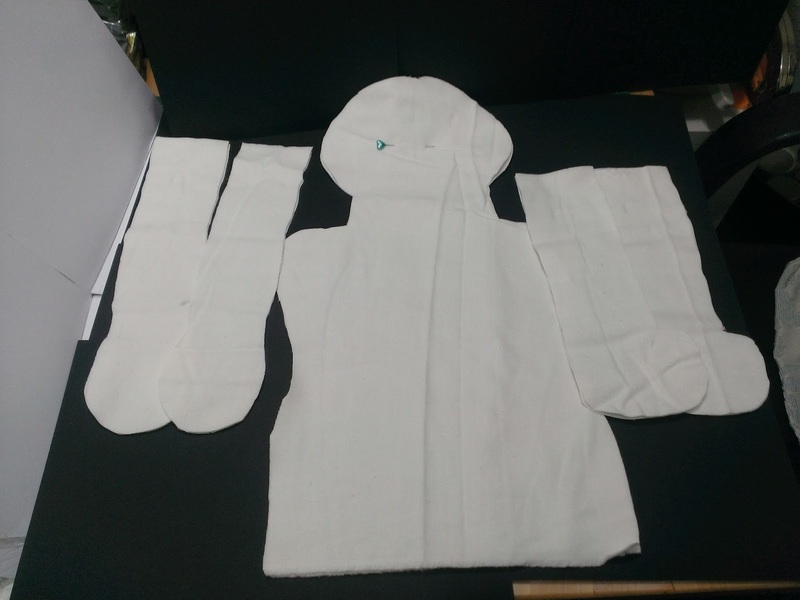 I cut out the doll shape and this became the template for my dolls body and dress. I pinned the template to some soft, buttermilk type fabric I had in my stash and cut out my doll shape, leaving a bit of room around it for seam allowance. Once I had the basic doll shape cut out, it was just a matter of putting the doll together (she says like some sort of expert....Puhh!). 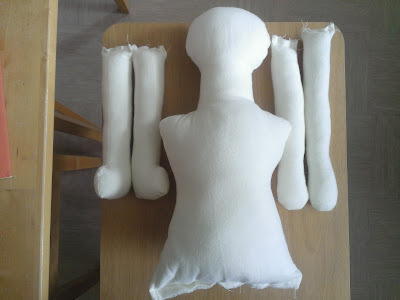 I sewed around the perimeter of the torso and limbs, leaving a sizeable gap unsewn so I could stuff the doll with doll stuffing. I used a straight stitch as well as a zig zap stitch to help prevent fraying as the material from my stash tended to fray. So I wanted the stitching to hold up well once I stuffed the doll, etc. It's Aliveeeeeee! Well, nearly, teehee. I stuffed the doll with the toy stuffing and closed up the gaps. I then sewed the arms and legs onto the doll. She is already beginning to take shape. Isn't she pretty? Now for the fun part. Dressing the doll. Remember the rough template I drew for making the doll? 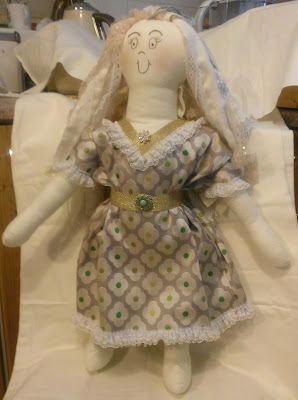 I used it for making the doll's dress....no patterns here people. 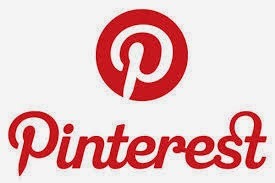 Remember......I'm a very big novice to sewing, lol. Obviously because the doll has mass and volume and a great big wad of stuffing in her, the template was going to be a bit too small. So I simply added a few inches to the initial template and it worked out great with a bit of clever adjusting. I cut the lovely Daisy Pistachio fabric that Hilary's supplied me with and whizzed it through my sewing machine. I gathered the dress in at the waist to give it a bit more shape and volume. I kept the front of the dress pretty flat with the sides having the volume from the gathering. I added this lovely gold trimmed lace and gold ribbon from my stash to embellish the dress. I think the gold colour really compliments this Daisy Pistachio fabric from Hilary's. And of course, no dress is complete without some bling. The green belt bling is actually an earring that I had in my stash. I think I bought it from Primark's. The little bling around her neck was another stash staple. You might be able to just catch the glistening gold in the lace trim. The dress was so much fun to make. This fabric is so playful and colourful. Now, the big job......the dolls hair. This was the most time consuming part of the doll but honestly, it was completely worth it in my opinion. Boy was that a big job though. Each strand was hand torn pieces of fabric as I wanted that frayed look on the 'hair strands', rather than straight cut, regimented lines. I wanted this Rag Doll to look, well, raggy. I also added various beautiful narrow laces and trims to add texture and interest to the dolls hair. 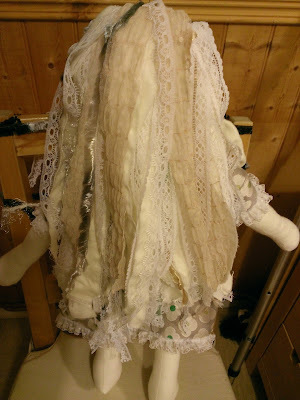 I had to hand sew each and every little bundles of the hair onto the dolls head in rows. I think there is around 4-5 rows of hair with about 6-8 bundles of hair (maybe more) in each row. The hair is so big, raggy and textured. I think it looks gorgeous. But you can tell me what you think. Sadly the photo isn't showing all the layers of laces and trims. 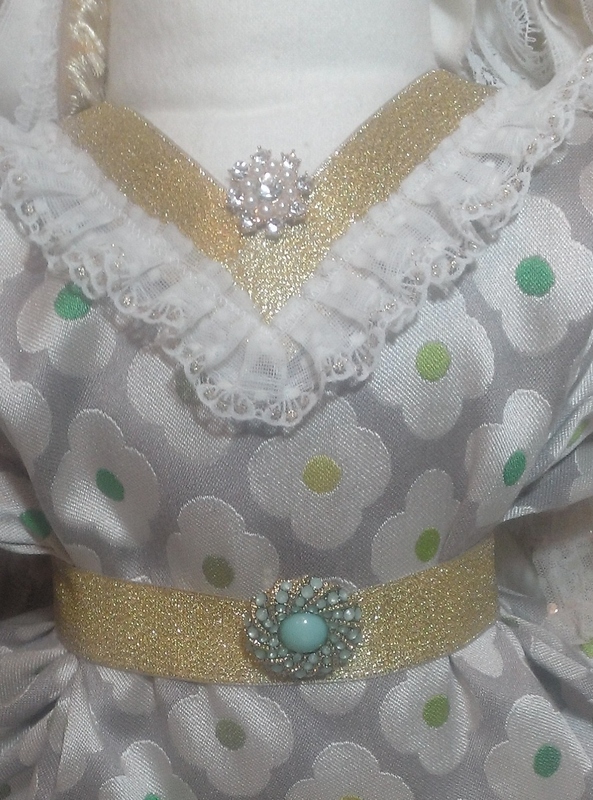 But I added gold, green and grey eye-lash trims to match the colours in the fabric. It's layered throughout the hair and is stunning when looking at it in real life. Sorry I couldn't pick that up better in the photos. And then the pretty little face. I used some Mica Powders to give her little blushing cheeks. Every little rag doll needs blushing cheeks, lol. The rest as you can probably tell, was badly drawn on by me, lol. 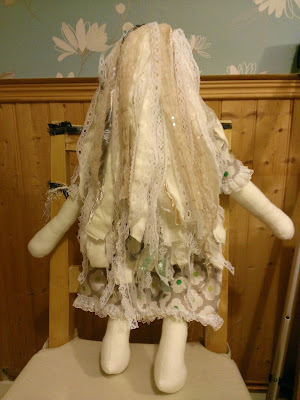 A photo of the completed Rag Doll with her hair down around her face. 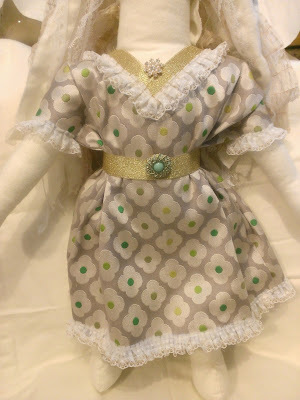 And a photo with her hair behind her shoulders with a nice clear view of the pretty Daisy Pistachio fabric dress in all its embellished glory. And the doll is complete. A special thank you to Hilary's for kindly asking me to participate and for sending me such pretty fabric to play with. The Competitors entries are really incredible and so professional looking.....and then there is my wee rag doll, lol. The final will be down to 10 entries and then through Social Media and a decision made by Hilary's Competition Judges, the Winner will be announced. So, if I'm lucky enough to make it to the final 10, I may need your help to get me some votes by Pinning, Liking and sharing through Social Media. However, I have to get to the final 10 though and the entries from everyone else are amazing. The competition is pretty tough and my sewing skills are pretty limited, teehee. But I can only keep my fingers crossed, lol. Have a look here to see all the Competitors entries. Wish me luck!